ZXing Barcode Scanning Library for Delphi XE to 10.2 Tokyo. ZXing.Delphi is a native Object Pascal library that is based on the well known open source Barcode Library: ZXing (Zebra Crossing). This port is based on .Net Redth port of ZXing and the Java one. This is I think the first native FireMonkey barcode lib. It is aimed at all of the FireMonkey mobile platforms and, starting from v3.1, it fully supports also Windows VCL applications (no dependencies on FMX.Graphics unit). With this library you can scan with native speed without the use of linking in external libraries and avoid compatibility issues and dependencies. It is fast. Its compatible with in Delphi XE7 - 10 Tokyo and tested with IOS 8.x, 9.x, 10x Android, Windows 32/64 and OSX. 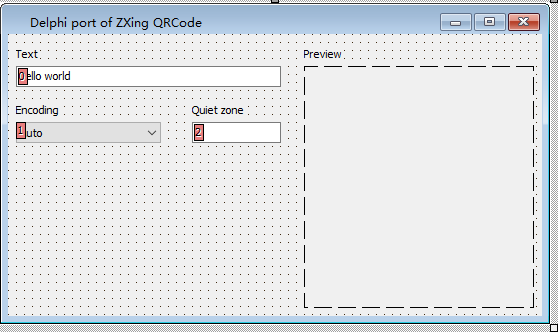 The goal of ZXing.Delphi is to make scanning barcodes effortless, painless, fast and build within your FireMonkey or native Windows (VCL or Firemonkey) applications. Just include the source files and add it in your existing projects and build the ZXing.Delphi source within your projects. - Native compiled barcode scanning for all VCL and FireMonkey platforms (IOS/Android/Windows/OSX). - 100% free. No license fees. Just free. - Added VCL support (via IFDEF USE_VCL_BITMAP). - Memleak fixes for old gen compilers (win32/win64). - Fix: QRCode ECI character set + extra unit test. - Added 'Load Image from file' command in test project. - Added DataMatrix (centered only). - Support for inverted 1D/2D code types. - Redesigned the file/folder structure for better namespacing. - Fix in Code128 where code did not scan at all sometimes. - Android added to compatibility list. - Fixed IOS crash bug on 32bit only (ITF related). - Implemented ITF (thanks p. b. Hofstede!) + unit test. - Implemented QR-Codes + unit test. - Implemented Code 93 + unit test. - Base classes 1D barcode implemented. - Implemented Code 128 + unit test. ### Tips - How to optimize an already fast library. - Try not to scan every incoming frame. - Use autoformat scanning with care, with automatic on every frame is passed to every barcode format. For example: If you want to scan only EAN-8, set the scan format for only EAN-8. - For mobile: try not to scan every frame, skip every n frame. Scanning 4 frames in a second should be good for most purposes. Safes CPU and battery. - For mobile: try setting your camera not to a high resolution. 640x480 is for most purposes perfect. More resolutions means more pixels to scan means slower. Saves CPU and battery. Although it works extremely well, we still miss a few barcodes.For me there is no immediate need yet for me to implement more types but I like to add all of them! For that I need your help! The base classes are already implemented so if you need to have another Barcode like Code39 (already done :-) ) you can see the C# source here: https://github.com/Redth/ZXing.Net.Mobile/blob/master/src/ZXing.Net/oned/Code39Reader.cs and convert it to Pascal. It's pretty easy (or just ask and I convert the raw classes for you). ### 'What is different compared to the original source and what do I need to know if I implement a barcode?' How did you do it? - Copy and paste the files to the project. - I made use of generic array lists. This is easier and strongly typed. - I stayed at the architecture and directory structure as implemented in the .Net source. - Add uses: ScanManager, ZXing.BarcodeFormat, ZXing.ReadResult. - Add var FScanManager, FReadResult. Of course the real world is not that simple. To leave your app responsive while scanning you need to run things in parallel. I created a test app to show you how just to do that. Its included. It makes use of the new Firemonkey parallel lib. In the testApp the resolution of the camera is set to medium (FMX.Media.TVideoCaptureQuality.MediumQuality) on my iPhone 6. This is only possible since XE8 and equivalent Appmethod. Its also good to mention that how higher the resolution the more time it takes to scan a bitmap. Some scaling could probably work too. Andrea Magni has a very nice blog post about an Android ZXing example from a training excerise of his. You can find it [here](https://blog.andreamagni.eu/2017/06/scannermapp-a-qrbarcode-scanner-app-with-delphi-zxing-and-tframestand/). ZXing.Delphi is a project that I've put together with the work of others. So naturally, I'd like to thank everyone who's helped out in any way. Those of you I know have helped I'm listing here, but anyone else that was involved, please let me know! - The ZXing Project Authors - Sean Owen. ZXing.Delphi is released under the Apache 2.0 license. ZXing is released under the Apache 2.0 license. ZXing.Net is released under the Apache 2.0 license. [DCC Fatal Error] UnitMainForm.pas(14): F2613 Unit 'FMX.TKRBarCodeScanner' not found.